Look. Laika’s latest is lovely. 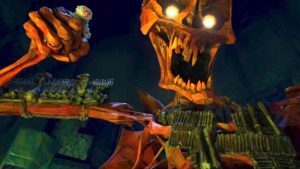 Stop-motion animation is incredible stuff and Laika’s stop-motion delivers aesthetically-pleasing achievements that are near-unbelievable. 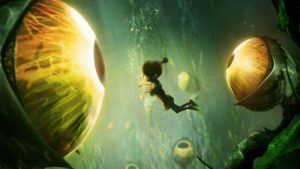 Kubo and the Two Strings, as the film is titled, swamps you in color and motion and clickity-clackity coolness. The story is pretty lame, though. It pains me to say it — since the production company is one I’d love to support — but all Kubo‘s coolness reflects, in this case, is the ample room for air to waft around inside one’s empty skull. Paranorman was much better. And it felt as if it relied less on computer effects than this one does — although I’m hardly an expert on such matters. In this film, the protagonist is Kubo, a boy with the magical ability to animate origami, something which no one much seems surprised about. Kubo’s mother (the voice of Charlize Theron) has hidden her son away from the night and her father, the all-powerful Moon King (Ralph Fiennes), plus his underlings — her spectral twin sisters (both Rooney Mara). Naturally, Kubo blows his cover and tragedy all too quickly flops into a string of emotionless adventures. For most of the film, Kubo meanders so as to accumulate the three special pieces of armor that will protect him from the Moon King. It was upon this same quest that his father was cruelly taken from him. You can see the air move inside the skull, if you look close. And it means absolutely nothing. Not a single thing. While the story flips Kubo and his magical companions (a monkey and a beetle-samurai voiced by Matthew McConaughey) between jovially ghoulish set pieces, one slowly begins to wonder who, and why, and what is going on. While imbuing a kids’ film with mystery is good stuff, there are limits. Who is this Moon King exactly? What is this armor and what difference will it make? What kind of weird magic lets one animate origami, or use a stringed instrument as a concussion weapon, or cast primarily non-Asian actors in Japanese roles in a film set in Japan? Hello Cleveland! We are Cheap Trick! Which isn’t to say that there isn’t charm or thrills to Kubo, just the glorious surface is soap bubble thin. One thought and: pop! The film does manage a consistent theme until the end — about memory and the strength of it — which is adequately involving. It’s just the plot that leaves you cold. To reveal the ending (AHEM), Kubo collects his magical trifecta of armored enhancements and then…. doesn’t use them for reasons never addressed. If his sword and magic helmet would, in fact, help against the Moon King, we never really see that come to be. 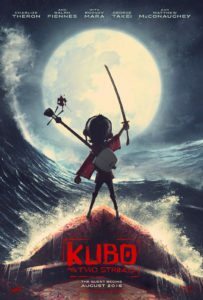 Kubo instead finds the power to overcome in his humanity and in his magic samisen, now strung with memories of his father, his mother, and himself. Good thing I speak Hovitos. But for a film about the power of memory, too many of the characters go about their lives unaware of who they’re with. And the Moon King, when defeated, is given a false set of memories upon which to base his now-human dotage. Why? I forget. Mumble, mumble forgiveness pass the nori. So: come for the animation and stay for the character and set design, but expect little in the way of story. And really: I know Toshiro Mifune is dead but c’mon Hollywood. There are a ton of amazing Japanese actors who could have voiced these parts. It’s enough already with the white washing. Yep, that about sums up how I felt about it. Seemed to be missing a story amidst the neat look.